I am still recovering from a ridiculously busy Easter and week following at Soul Survivor. SS was good although I spent most my time catching up with lovely old friends rather than delving into my ever fragile spiritual state. I was involved in a little Creative Writing workshop and I was once again stunned by the level of vulnerability and giftedness. I will tell you more about that in the future! The last few days at home with the girls has been about getting back into the routine of kinder and swimming lessons. And lots of chill out time. 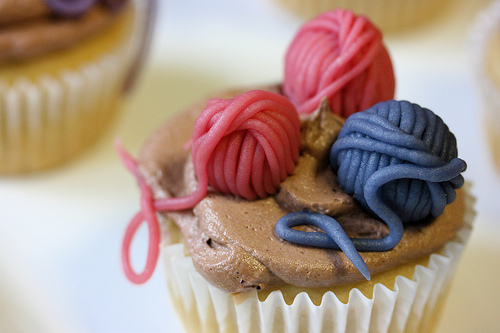 My time seems to be equally split between knitting and baking – hence the inclusion of the ‘knitting cupcakes’ (which I wish I could claim as my own, but I can’t, they are from here). This entry was posted on Wednesday, April 14th, 2010 at 6:46 am	and posted in Uncategorized. You can follow any responses to this entry through the RSS 2.0 feed.